What does it mean for you to be “healthy?” Have you ever defined what a healthy lifestyle looks like for you, or are you just hoping it will improve each day without intentional thought or action? Today, try something new. Try defining what “healthy” looks like. Define what your elevated life looks like. The elevated life is about doing what you love, but doing it better. We want to see you work better, love better, exercise better, and play better. My wife Elise and I have committed our lives to helping you live the elevated life, and we believe the most tangible way to do this is by investing in your health. We don’t want you to just think about what “stuff” you will have in the future, but how you will experience life. The elevated life is more than vacations and paychecks. 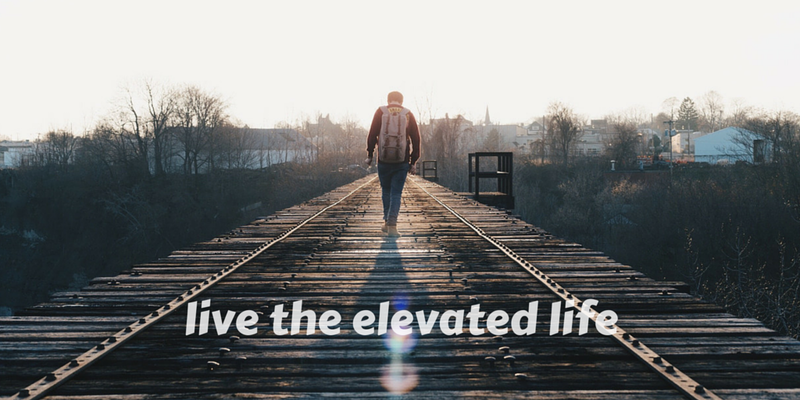 The elevated life is about experiencing life to the fullest. We believe when you place your health as a priority, every area of your life will improve. You will enjoy the people around you more, you will work harder and be happier, and that is what life is about. We are passionate about this message because we have seen it play out in our own lives. Our lives are in no way perfect, but we are able to enjoy life so much because we have made living healthy a priority. Your health is not meant to hold you back but to propel you forward toward living the elevated life. My wife Elise and I walk this walk on a regular basis. We have committed to implementing the steps to wake up feeling rested, refreshed, and energized to begin each day. This alone brings joy and energy which we share together. We love spending our mornings in God’s Word. This helps us prepare our hearts for each other, serving our Lord, and preparing our minds to serve the people around us at a higher level. We cook a healthy breakfast together, enjoy coffee, and often throw some fruits and leafy greens into the Vitamix for a quick, healthy smoothie. By this time, it is usually off to the the gym for me and either the same for Elise, or a nice morning run with a few of her girlfriends. We take advantage of our love for fitness through tons of outdoor activities in our beautiful state! During the workday we maintain energy with lots of water. We have found that intentionally focusing on why we do what we do and assuming the best about each other and our team decreases unneeded anxiety and builds trust in our team. We work very hard and enjoy knowing that we did our best with what God has given us. We know that the cornerstone of a full, healthy and abundant life is in proper health from the inside out. I get my specific chiropractic adjustments once a week to maintain a healthy spine and clear nervous system, and Elise gets adjusted 1-2 times per week. We live this way because of the fact that health and healing comes from the inside out, not from the outside in like so many have been lead to believe. This is why we have dedicated our lives to specific, neurologically based chiropractic care. This is about not only helping our community feel better, but HEAL better. When your brain and spinal cord are functioning better, the only result is better health. Our evenings include decompressing as Elise finds a few laughs at my lame (very lame) jokes, and she usually makes a healthy meal while I help prepare a few things and handle the dishes. To follow, we spend time together and usually head to bed to start another day. Our life is full. However, we are able to do so much more than most people and enjoy those things more because we feel healthy. We do not feel like we were dealt a lucky hand but we are reaping the benefits of consistently choosing to take responsibility for our health. Our heart is to help people live the elevated life. This lifestyle has little to do with just feeling good or having money, but it is simply about living the life you were created to live, and helping you create vision and dreams for what your life could look like with proper action. Our lives are committed to helping people live the life they were created for. You were created to live an elevated life. When will you start?